Please Share, Tweet, and Pin to show your thanks! 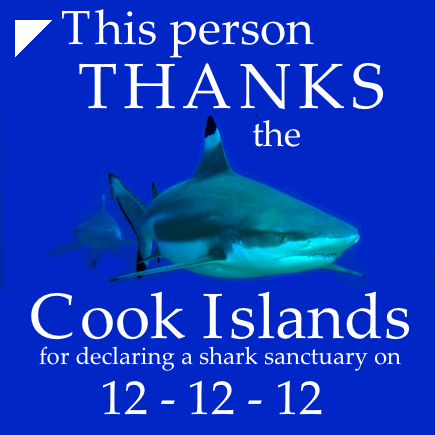 The Cook Islands created a 1.9 million square kilometers shark sanctuary in their ocean today. The Mayans were wrong -- today wasn't the end of the world, it was the beginning of the end of the overfishing of sharks! "We are proud as Cook Islanders to provide our entire exclusive economic zone (EEZ), an area of 1.9 million square kilometers as a shark sanctuary,” said the Honorable Teina Bishop, Cook Islands minister of marine resources when he made the announcement today. “Together with our Polynesian neighbor, Tahiti Nui (French Polynesia), we have created the largest shark sanctuary in the World. We join our Pacific neighbors to protect this animal, which is very vital to the health of our oceans, and our culture." The Pew Environment Group has more information on their website. I've been meaning to learn to surf but I'm really terrified of sharks although some shark-related accidents are steep since there is an enhanced security in training grounds now. Despite of my fear, I'm glad that people take building a healthier ecosystem for these bulky creatures into consideration. It's for sustainable development, after all.